A lot of Democrats want the Clintons to just go away. Many Clintonites hit the GOP and the media for rehashing the 2016 election and saying we should just move on, except her royal majesty and Slick Willy keep bringing it up with their public appearances; the former first lady worst of all really. She absconded to India this year, where she trashed Trump voters, calling them backwards, racist, and sexist at their core. And you really wonder why this woman lost the election. She also said that while she lost the 2016 race, she won the areas that mattered, more or less, whatever that means. It was a more eloquent way of repeating the deplorables remark. So, if her inner circle is frustrated with the fixation on the Clintons, they only need to look at Lady Macbeth herself. Red state Democrats fled from these remarks, though is it because they truly believe they’re not helpful, along with being insufferable snobby, or are they just worried about re-election. Maybe it’s a bit of both. Yet, even as she whines and sulks alone, her party is still paying for her epic defeat—literally. 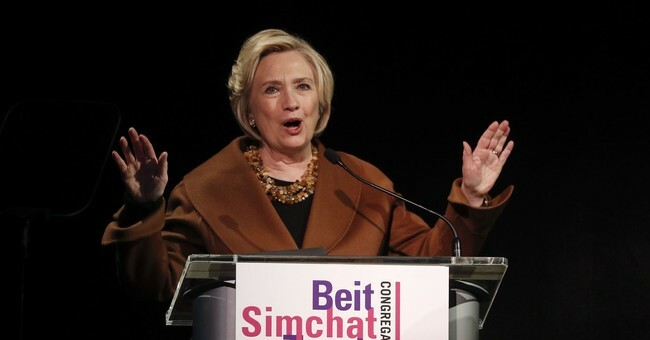 The Democratic National Committee has paid her nearly $2 million for accessto her email lists, while the Democratic Congressional Campaign Committee had paid around $700,000. The DNC is already cash-strapped and virtually bankrupt, taking out nearly $2 million in loansto keep the lights on. Longtime Clinton supporters last week received an invitation offering access to the family (the green invitation features photos of Bill, Hillary and Chelsea) at a Clinton Foundation benefit on May 24in New York, at prices ranging from $2,500 ("Friend") for cocktail party and dinner, up to $100,000 ("Chair") for "Leadership Reception for two, a premium table of ten, program recognition as Gala Chair and invitations to the Clinton Foundation Annual Briefing." The foundation's streamlined mission: "create economic opportunity, improve public health, and inspire civic engagement and service." Hillary Clinton this morning will lead the first meeting of her Onward Together political group, on New York's Upper East Side. She and Howard Dean will welcome 11 partner organizations for a day of sessions "about harnessing the energy and activism post-election." In the afternoon, the groups have the chance to meet with 150 donors. Last year, OT had 33,000 donors and gave over $1 million to partner groups. The group says that figure will be higher for midterms this year. President Clinton publishes a novel on June 4, co-authored with thriller writer James Patterson, "The President Is Missing"(preorder link).The two will appear together at BookCon, a massive booksellers' convention, at the Javits Center in New York on June 3. Tickets are already sold out. Then the pair have a multi-city book tour in June — together and separately. An eight-part series comes to Showtime in 2019. Yeah, like before the 2016 race, the Clintons are loaded, connected, and are going to have a happy retirement, and by retirement—I mean the occasional whine fest from the former first lady on how she couldn’t seal the deal from time to time. Nothing wrong with making lots of money; this is America. But are they fighters for the people? No, which was why she could never connect effectively enough with the working class. Oh, that and she never campaigned in the areas where these people could have put her over the top. She lost the white rural voters three-to-one to Trump. If it had been two-to-one, she probably would be president. Yes, folks, these people are trying to make their comeback. Despite a pledge never to run for office again, they can’t seem to exit the spotlight. It’s a double-edged sword for Democrats. The Clintons and the Obamas are really the only heavyweights Democrats have that draw a crowd. Both are also equally useful as lightning rods for Republicans, especially when it comes to fundraising and animating the base. For now, the Left has to deal with the Clintons, use their notoriety and star power, while also acknowledging that they’re totally in it for themselves—which was probably the case all along. It’s the bloody Clintons.